November 22, 2013 – 6:00 pm to 9:30pm. As the snow begins to fall, it’s time to bundle up and head to downtown Orangeville to join the merchants as they kick off the holiday shopping season with the annual Moonlight Magic Tree Lighting Ceremony. Gather around a giant Christmas tree at Orangeville Town Hall where the Town Crier and local dignitaries will light the beautiful Christmas tree and officially usher in the season. Santa will personally deliver the first presents of the season to a lucky girl and boy before greeting other children. 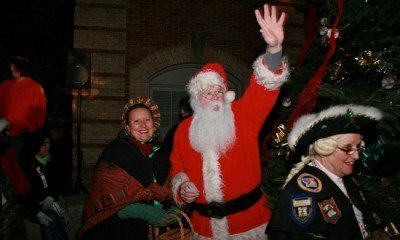 Join in festive activities such as a performance of “ ‘Twas the Night Before Christmas” by Theatre Orangeville, marvel at the brightly-lit Tractor Parade of Lights, brought to your by our local farmers, as it winds its way along Downtown Broadway and enjoy a free horse-drawn wagon ride. Toast some marshmallows and warm up at inviting fire pots as you stroll along Broadway looking for the perfect gift for someone special.Moonlight Magic and Tractor Parade of Lights.